This equipment makes the tool do the radial movement on the rotated cutter disc through the support of boring bar and the swivel feeding of operating platform to realize the treating to the elbow inner bore diameter and the bore-hole. A: We are a manufacturer with our own factory. A: Generally, it is 3 months after payment, or it depends on the quantity of order. Q:What about the after-sale services? A:We provide 12 months quality warranty after dispatch. We also offer long-time technical advisory services. A:We can take any type of transpotation according to the customer's demand. 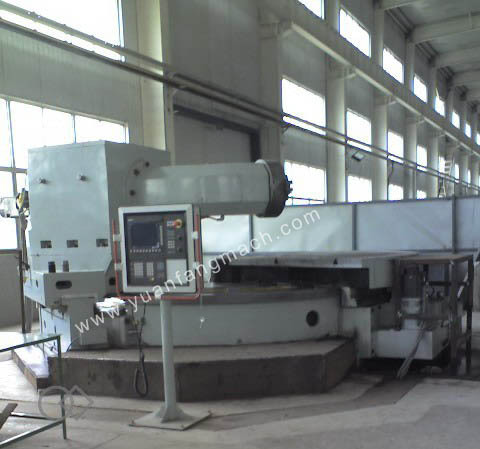 A:Yuanfang Machinery Manufacturing Co., Ltd. is located in Jiangyin City, Jiangsu Province, China. It is founded in 2006, covering an area of about 40,000 m2 with a gross investment of 120 million RMB. Yuanfang Machinery Manufacturing Co., Ltd. is an enterprise majoring in designing, manufacturing and selling large metallurgical, environment friendly and non-standard equipments. It is also a professional manufacturer in finishing and grinding series equipments applied on the subsequent processes after steel producing. The company passed the ISO9001 international quality certification in 2007. In 2009, it was identified as the “High and New Tech Enterprise in Jiangsu Province”. In the year of 2010, it passed the ISO14001 Environmental Management System Certification. Please feel free to contact with us for detailed information, we will reply you at once. Jiangyin YuanFang Machinery Manufacturing Co.,LTD. If you're looking for the highly cost effective elbow boring machine, please be free to consult the quotation with our factory. As one of the leading manufacturers and suppliers in China, we also offer the customized products made in China with reasonable price.